Sweden's Karin Borjeskog is a rarity in women's golf: She's a lefty. Left-handers are becoming more common in men's golf, but still are rarely seen in women's golf. Karin's biggest amateur win was at the prestigious St. Rule Trophy in 2003, where she set a women's course record on the New Course at St. Andrews. After turning pro, she has played a couple seasons on the Ladies European Tour, but in 2009 played on the SAS Masters Tour (formerly known as the Telia Tour). And with much success - Borjeskog was that tour's Order of Merit winner in 2009. You've seen Susan Choi before as a member of the Big Break: Kaanapali cast. 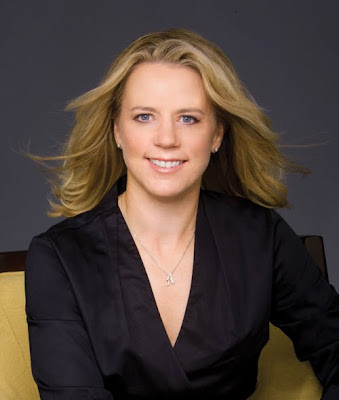 She was the fun-loving, good-natured golfer who captured many fans during that Golf Channel series' run with her charm. Now you can see her as part of Golf Pro Girls, where Susan is among the half-dozen female touring professionals who serve as guides, video hosts and demonstrators at the new golf Web site. Kwiat is a New York-based diamond brand. LPGA-based Cristie Kerr sparkles like a diamond herself. No wonder the two hooked up. Kwiat and Kerr partnered to create earrings and a pendant, with a portion of the sales proceeds benefiting Kerr's Birdies for Breast Cancer foundation. "I am delighted to have Kwiat join us in our mission to raise funds and awareness for breast cancer," Kerr said. "The earrings and the pendant they created are truly stunning. Our hope is that these subtle pieces will serve as a reminder of those we have lost to the disease, and represent our hope for the future." 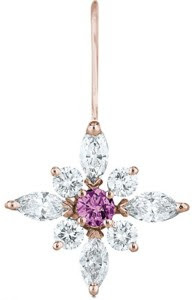 The Kwiat/Kerr collection is known as the Signature Platinum Star Collection, with both pieces set in 18-carat pink gold and accented with a pink sapphire. Cristie will wear the pieces during competition in 2010. The collection was officially unveiled in December 2009 in Las Vegas. The pieces go on sale at Kwiat Las Vegas and at other Kwiat retailers in January 2010. The pieces will also be available at Kwiat.com and CristieKerrGolf.com in early 2010. Hee Kyung Seo was the best player on the Korean LPGA in 2009. Above, she's practicing some dance moves. Below, she's all dressed up. Why? Every year in December, the KLPGA throws a big bash to celebrate the year just completed. They hand out awards for the top players on tour as well as the best of the international Koreans. It gives the ladies a chance to get dressed up and enjoy themselves. The award show is well covered in the press, a nice advertisement for the tour (the LPGA might take some notes!). The show also gives some of the players a chance to play entertainer for a day! That's right. KLPGA players gather for a lavish awards ceremony where some of them even get up on stage and perform in dance numbers! Cribbing again from The Constructivist, Hee Kyung Seo's 2009: "Won 3 majors and 2 non-majors this season on her way to claiming Player of the Year and the money-list title on the KLPGA." As a second-year professional, Stacey Bieber will play full-time on the Duramed Futures Tour in the 2010 season. Bieber grew up in Winnipeg, Manitoba, and studied finance at Texas Christian University. Stacey had ups and downs during her first year on the Futures Tour, but she learned the rigors of life as a tour player. "This past season I was able to get my feet wet out there. Now I really know what it takes to make it as a professional golfer. I have to improve my ball flight this winter, and I am setting a goal to earn full LPGA status in 2011." Stacey is also an on-camera talent and one of the founders of GolfProGirls.com. GolfProGirls.com features some of the nation’s top PGA teaching professionals, beautiful golf destinations (and occasional vacation giveaways), and much more. Bieber and her fellow "Golf Pro Girls" serve as video guides and demonstrators. 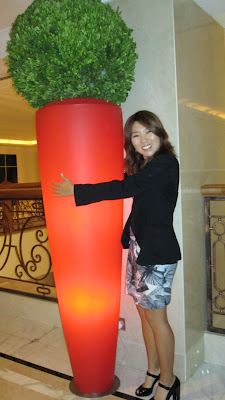 Not sure why In-Kyung Kim is hugging a giant carrot, but I do know that she brought out the stick this week in Dubai. Inky tied the course record with a second-round 65, and didn't let up, posting a 67 and final-round 68 to sure the win at the Dubai Ladies Masters on the Ladies European Tour. We continue our series on golfers who graduated from 2009 LPGA Q-School with Nicole Hage, whose photo above is taken from her Play Golf Designs portfolio. Nicole got the job done at Q-School finals by laughing at the final-round pressure and shooting a 68. That moved her up into a tie for ninth, easily within the Top 20 who earned LPGA Tour cards for 2010. 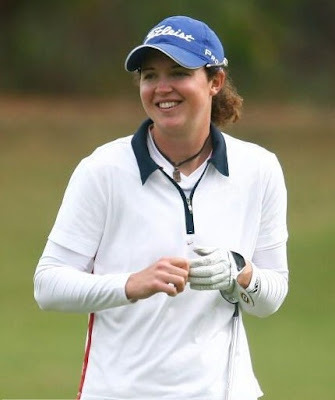 Nicole had non-exempt status on the LPGA in 2009, and got into three tournaments, but played mostly on the Duramed Futures Tour during the past year. She first gained partial LPGA status in 2008, after graduating from an All-American collegiate career at Auburn. Now, in 2010, she'll get her first full year of LPGA action. Wait, didn't we do a post about Marianne Skarpnord just a few days ago? Yes, we did. But that's OK, as one of Marianne's supporters said in an email, "she's too good for you not to have more pictures." Last week we wrote about Marianne after her stellar second round at the LPGA Final Qualifying Tournament. Her entire week turned out to be pretty stellar. She finished tied for second at the Q-School finals, earning her LPGA Tour card for 2010. And she'll be just the second Norwegian on the LPGA, joining Suzann Pettersen. This calls for a celebration - lutefisk for everyone! See more pics of Marianne here on Golf Babes, or check out her Web site. Katie Kempter finished tied for second at the LPGA Final Qualifying Tournament, earning her place on the 2010 LPGA Tour. Katie played collegiately at the University of Denver for four years, posting two victories. Prior to that, she was a two-time New Mexico Female Golfer of the Year and won the state championship her senior season in high school. After earning her card at Q-School, Katie said, "I don't think it has settled yet. I could go play another 20 holes of golf right now. I had so much fun this whole week, even with the rain delays and everything. I got lucky enough. So, just the whole week, you know, I had a blast. My whole goal this week was to come out and win and lets enjoy the experience, because you never know if you're going to get this chance again." Amanda Blumenherst is your 2009 medalist at LPGA Q-School. Blumenherst won the Final Qualifying Tournament by two strokes on Monday, securing her place on the 2010 LPGA Tour. Blumenherst was a bloomin' beast in college at Duke. She was NCAA Player of the Year each of her first three seasons, and never finished outside of the Top 10 in those three seasons. She won 12 tournaments. Blumenherst also was the 2008 U.S. Women's Amateur Championship winner, and has shown very well in a handful of LPGA Tour appearances to date. She's going to be a great play. And she'll be fun to watch because she has a weird swing. Very Furyk-esque. Is your Christmas shopping done? Or are you still hunting for something unique for your golfin' honey? Charlotte Campbell might have an answer for you. 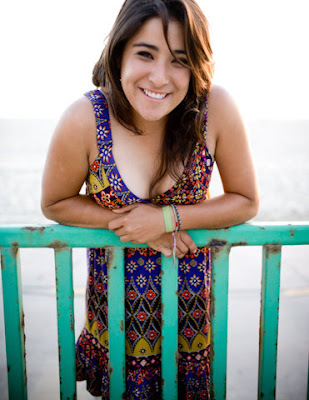 Charlotte had a great collegiate golf career and has been playing professionally since 2006. She was the winner, along with brother Rob, of the Golf Channel's Highway 18. But she also has a side business that has grown into something good - Blingo Ballmarks. Yes, that's Natalie Gulbis to the left sporting Blingo. Charlotte got to work with American Solheim Cup captain Beth Daniel custom-designing some Blingo ballmarks for the U.S. team. 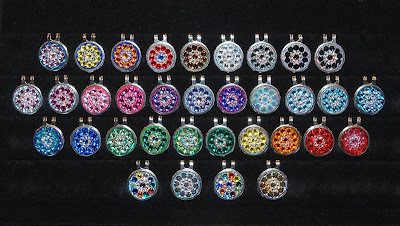 She can even custom-design one for you (depending on what design you want, of course - not all requested designs are feasible when working with Swarovsky crystal). A sampling of the "regular" assortment of Blingo ballmarks is in the photo below. So long as you place an order by Dec. 19, Charlotte should be able to get your Blingo to you by Christmas. Plus, there's a 10-percent-off holiday sale ongoing now. Visit the Blingo Web site for more info, including ordering instructions. Charlotte is also working with a new, online subscription-based golf "magazine" called Golf Pro Girls. Charlotte serves as a video host and interviewer for video clips in which the Golf Pro Girls visit top instructors, top courses and resorts, go over rules situations, and more. Marianne Skarpnord is currently in Daytona Beach, Fla., attempting to earn her LPGA Tour card for 2010. If successful, she'll join Suzanne Pettersen in representing Norway on the LPGA. And Marianne is in pretty position after a second-round 66 today, which moved her into the Top 10. There are three rounds to go as this is written. The 2009 season was real breakout year for Marianne. Playing on the Ladies European Tour, she posted two victories, two thirds and a fourth-place finish, plus four other Top 10 finishes, and is fourth on the LET money list.